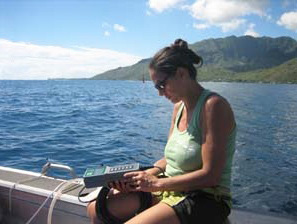 Adina Paytan, here measuring seawater chemistry in Tahiti, studies chemical and biological processes in the oceans. Adina Paytan, a research professor in the Institute of Marine Sciences at UC Santa Cruz, has been awarded the Excellence Award of the Werner Petersen Foundation based in Kiel, Germany. This prestigious award is given to leading international scientists for excellence in their particular field. The foundation is honoring Paytan for her "outstanding contribution in the fields of biogeochemistry and oceanography." Paytan studies chemical and biological processes in the oceans, how they have changed over time, and how they are affected by human activities. Her research addresses a wide range of questions involving the global systems that affect ocean productivity, seawater chemistry, nutrient cycles, and water pollution. An over-arching goal of her lab's research is to link changes observed in the Earth and ocean systems to global changes in climate and tectonics, with an emphasis on human impacts. The Excellence Award of the Werner Petersen Foundation includes prize money of 20,000 Euros. As part of the award, Paytan has been invited to present a public lecture at the Helmholtz Centre for Ocean Research Kiel (GEOMAR), as well as provide a thematic short course for GEOMAR graduate students.